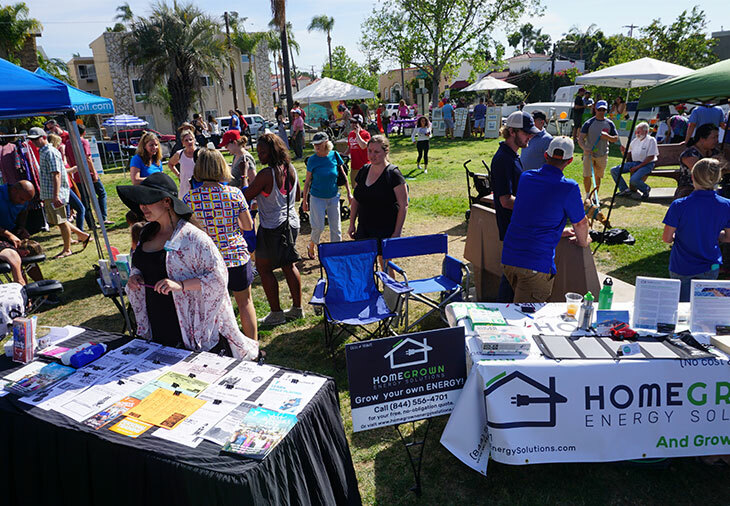 Kensington may normally be a quiet nook in San Diego, but on April 22 it burst forth with activity for the inaugural Spring Walkabout. The event, put on by the Kensington Talmadge Business Association, was designed to create awareness of Kensington and Talmadge’s many brick-and-mortar and home businesses. Forty businesses participated, offering more than 500 visitors and locals free samples, discounts on food and drinks, and giveaways. Thirty nine lucky folks won prizes generously donated by business participants. Megan Beauvais, an entrepreneur and Realtor with a business based in Kensington, is the President of the KTBA, and was instrumental in bringing the event to the community. “Our hope is that the walkabout created an awareness of all of our fantastic and diverse businesses that are available not only to us locally, but also to the general San Diego population. We think we started something here and we are so excited!” she said. The business owners on Adams Avenue in Kensington, as well as the home-based businesses, who had tables set up in the park, agreed that the event was a resounding success. Steve Oas, owner of both Snapology of San Diego and The OAS Center in Kensington, had a kid-friendly tent set up with crafts and musical instruments at the Walkabout. “The Walkabout was a great event that gave us an opportunity to show the community what we are all about… Everyone had a great time creating and exploring our center. Outside, the drum circle was a big hit! I look forward to doing it again!” he said. See photos from the event on our Facebook Page here.